You have your huge black robe, a creepy dementor mask, and what are you forgetting? Maybe theme music to walk into the party playing? No, that can't be it. Or, would it be cool to play monster music while entering rooms? It's not to cool jams, You're forgetting an important accessory. You're forgetting the wrinkled decrepit dementor hands! 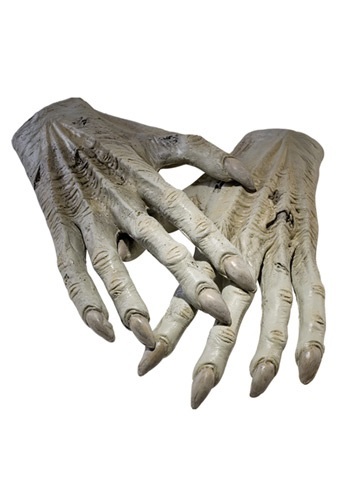 Bring your costume to the next level of creepy with a pair of officially licensed from the depths of the Harry Potter movies, Dementor Hands! With a glove like fit they will surely be a crowd-pleaser while terrifying your friends. The latex gloves are grey in color with detailed fingers and nails. You'll get some complements on how creepy your hands are this Halloween by both the magical and muggles alike. The items I ordered were all of good quality and just as described on line. What surprised me most was delivery - just a few days and in perfect order. This was a successful purchase! !